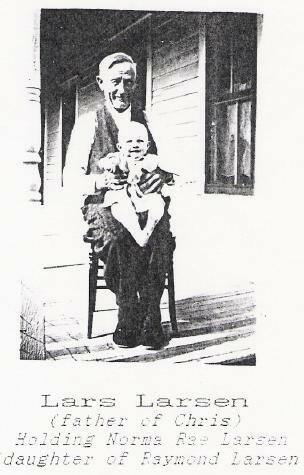 Joseph Hruska was born circa 1869 at Dakota Territory. He was the son of Frank Hruska and Anne Kosnarona. [S247] U.S. Federal Census 1870 U.S. Federal Census, by Ancestry.com, Dwelling 119. Name Variation Kate Hruska was also known as Katie. Married Name circa 1895 As of circa 1895,her married name was Bartunek. Kate Hruska was born in February 1877 at Dakota Territory. Kate Hruska married Joseph Bartunek circa 1895. Kate Hruska died in 1945 at South Dakota. Kate Hruska had 3 with 3 living in 1900 children. [S245] U.S. Federal Census 1900 U.S. Federal Census, by Ancestry.com, Year: 1900; Census Place: Township 96, Bon Homme, South Dakota; Roll: T623_1546; Page: 1A; Enumeration District: 29. [S9] South Dakota, South Dakota Birth Records South Dakota, File Date: February 07, 1957 (unknown file date). 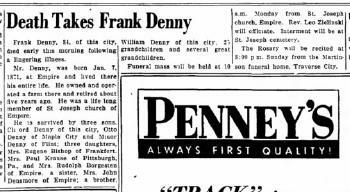 Name Variation Frances Hruska was also known as Fanny. Married Name after 1910 As of after 1910,her married name was Navratil. Frances Hruska was born circa 1879 at Dakota Territory. Frances Hruska married Joe Navratil after 1910. [S244] U.S. Federal Census 1910 U.S. Federal Census, by Ancestry.com, Year: 1910; Census Place: Tabor, Bon Homme, South Dakota; Roll: T624_1475; Page: 8B; Enumeration District: 0028; Image: 884; FHL Number: 1375488. As of 1920, John Frank Hruska was never married. [S243] U.S. Federal Census 1920 U.S. Federal Census, by Ancestry.com, Year: 1920;Census Place: Tabor, Bon Homme, South Dakota; Roll: T625_1714; Page: 4A; Enumeration District: 19; Image: 500. Joseph Bartunek was born in March 1866 at Bohemia also reported as Czechoslovakia. He married Kate Hruska, daughter of Frank Hruska and Anne Kosnarona, circa 1895. Joseph Bartunek died on 9 July 1939 at South Dakota at age 73. Joseph Bartunek immigrated in 1876. Name Variation Agnes D. Bartunek was also known as Aggie. Married Name 25 November 1919 As of 25 November 1919,her married name was Juran. Agnes D. Bartunek married Adolph Juran on 25 November 1919 at Charles Mix, South Dakota. Agnes D. Bartunek died in September 1987 at age 89. Lewis Durst was born circa 1862 at Maryland. He was the son of Henry C. Durst and Catherine Feisch. Henry Durst was born circa 1864 at Maryland. [S246] U.S. Federal Census 1880 U.S. Federal Census, by Ancestry.com, NA Film Number T9-0509 Page Number 345D. Mary Ann Durst was born circa 1866 at Maryland. She was the daughter of Henry C. Durst and Catherine Feisch. Sarah A. Durst was born circa 1868 at Maryland. Josiah Durst was born circa 1871 at Maryland. John Durst was born circa 1861 at Maryland. Sarah Durst was born circa 1852 at Maryland. [S248] U.S. Federal Census 1860 U.S. Federal Census, by Ancestry.com, Page 245. Dwelling 1811. Archibald Durst was born circa 1854 at Maryland. Witthman Durst was born circa 1857 at Maryland. Martha Durst was born circa November 1859 at Maryland. Name Variation Ann (?) was also known as Feich. Ann (?) was born circa 1782 at Germany. Unknown (?) married Mary Y. (?) circa 1892. Married Name September 1948 As of September 1948,her married name was Grapes. Norma Rae Larsen was born on 1 January 1930 only child to make it past infancy. She was the daughter of Raymond B. Larsen and Alice Rae Hamaker. Norma Rae Larsen died on 18 September 1949 at Wyoming at age 19 Mrs. Robert (Norma) Grapes, 19, formerly of Lusk, was killed in an auto crash on the Lincoln Highway, 33 miles east of Rawlins, Sunday, when a convertible in which she was riding failed to make a curve. Cross Rivas, 32, driver of the car, was also killed. Patrolman H. W. Clingman, who investigated the accident, said Rivas was hurled 86 feet and Mrs. Grapes 34 feet from where the vehicle stopped. He said the car was traveling at a high rate of speed. 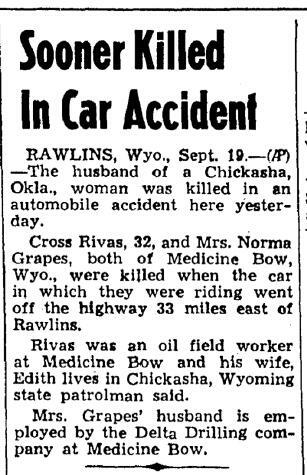 It is understood that Mrs. Grapes and Rivas were going to Medicine Bow where she was to meet her husband, an oil field worker. Rivas also worked at the field, and the two families were friends and neighbors. Funeral services for Mrs. Grapes are being held at the High School in Harrison, Thursday afternoon at 2:00 o'clock, and burial is to be made in the Lusk cemetery, with graveside services here. Rev. Juell of the Congregational Church will officiate. Mrs. Grapes is the only child of Mr. and Mrs. Ray Larson of Harrison. She was born there and graduated from Harrison High School. She then took a beauty course at Hall's Beauty School, Casper, and took over management of the Modern Beauty Salon of Lusk on August 1, 1948. She was married to Robert Grapes in September of 1948, and until July lived at Newcastle, where he was employed in the oil fields. He was then transferred to Medicine Bow. She was buried in September 1949 at Lusk Cemetery, Lusk, Niobrara, Wyoming. Married Name after 1957 As of after 1957,her married name was Larsen. Mayme (?) married Bryan William Larsen, son of Lars Chris Larsen and Ane Maria Pedersen, after 1957. 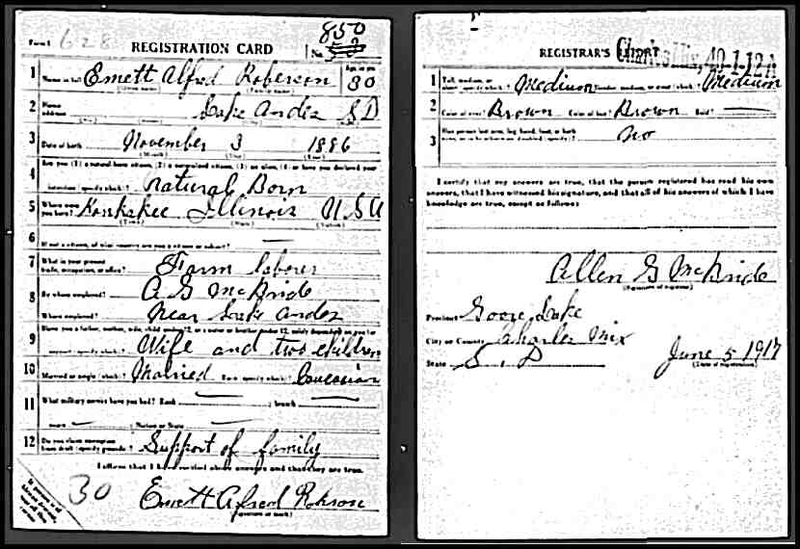 Name Variation Emmett Alfred Roberson was also known as Emett. 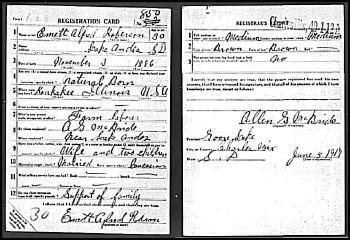 Emmett Alfred Roberson was born on 3 November 1886 at Illinois also reported as Denmark. He married Cora Evans Ruiter, daughter of Jelle Johnson Ruiter and Henrietta Jones, circa 1913. Emmett Alfred Roberson died on 25 September 1959 at age 72. He was buried after 25 September 1959 at Siskiyou Memorial Park, Medford, Jackson, Oregon. [S243] U.S. Federal Census 1920 U.S. Federal Census, by Ancestry.com, ED41. Dwelling 127. [S250] U.S. Federal Census 1930 U.S. Federal Census, by Ancestry.com, ED2-24. Dwelling 46. Name Variation Ferne Harriot Roberson was also known as Fern. Married Name 3 November 1946 As of 3 November 1946,her married name was Johnson. Ferne Harriot Roberson was born on 22 November 1913 at Lake Andes, South Dakota. She was the daughter of Emmett Alfred Roberson and Cora Evans Ruiter. Ferne Harriot Roberson died on 28 July 1993 at age 79 A memorial service for Ferne H. Johnson will be held at 11 a.m. Saturday at the Eastwood Baptist Church. Pastor George Nye will officiate. Mrs. Johnson, 79, of Medford, died Wednesday (July 28, 1993) at Three Fountains Nursing Center. Memorial Contributions may be made to Eastwood Baptist Church, 675 N. Keeneway Drive, Medford, OR 97504. Mrs. Johnson was born Nov. 22, 1913, in Lake Andes, S.D. On Nov. 3, 1946, in Medford, she married John T. Johnson Jr., who survives. She was an active member of the Eastwood Baptist Church for the past 40 years. Survivors, in addition to her husband, include a son, Gary Johnson, Central Point; a daughter, Gayle Leslie, Medford; a sister, LaMae Hughes, Phoenix; nine grandchildren and a great-grandchild. She was preceded in death by a brother, Roy Roberson. Friends may pay their respects from 4 to 6 p.m. today at Perl with Siskiyou Funeral Service. Perl with Siskiyou Funeral Service handled the arrangements. Roy T. Roberson was born on 9 May 1915 at South Dakota. He was the son of Emmett Alfred Roberson and Cora Evans Ruiter. Roy T. Roberson died on 4 August 1989 at age 74. He was buried after 4 August 1989 at Willamette National Cemetery, Happy Valley, Clackamas, Oregon, Inscription: LT COL US ARMY, WORLD WAR II. Roy T. Roberson obtained US Social Security Card at South Dakota; last residence Corvallis, Benton, Oregon. Married Name 26 September 1942 As of 26 September 1942,her married name was Frohreich. Betty Herrin was born on 7 February 1925 at Oregon. She was the daughter of Robert H. Herrin and Dorothy (?). Betty Herrin married Dale Robert Frohreich, son of Paul Gotthelf Frohreich and Lillian Grace Ruiter, on 26 September 1942. Betty Herrin died on 1 March 2010 at age 85 Betty Frohreich of Corvallis died Monday, March 1, 2010, at Corvallis Manor. She was 85. Arrangements are pending with DeMoss-Durdan Funeral Home and Crematory. -------------------------- Betty Frohreich of Corvallis died Monday at Corvallis Manor. She was 85. Betty was born in Ashland to Robert and Dorothy Herrin. She married Dale Frohreich in North Bend, Wash., on Sept. 26, 1942. Betty was a homemaker and a wonderful mother, grandmother and great-grandmother. She enjoyed bowling and crafts, and was an avid antique collector. She and Dale were both members of the Elks Lodge. She is survived by her sons and their wives, Larry and Linda, and Richard and Judith; daughter, Judy Camille; grandchildren Kristin, Dylan, Jennifer and Anthony; great-granddaughter, Violet; and sister, Patsy Nelson. She was preceded in death by her husband, Dale; son Robert; and brother, Martin Herrin. She was buried after 1 March 2010 at Mountain View Cemetery, Ashland, Jackson, Oregon. Betty Herrin and Dale Robert Frohreich lived in 2000 at Corvallis, Benton, Oregon. Frank Denny was born on 7 January 1871 at Empire, Leelanau, Michigan. 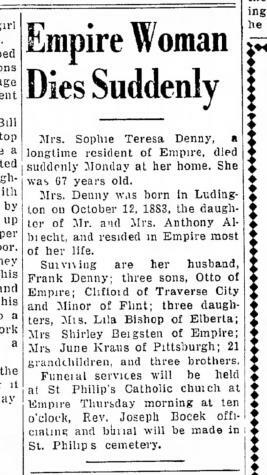 Frank Denny married Sophia Teresa Albrecht, daughter of Anthony Albrecht and unknown (? ), circa 1902. He was buried after 15 December 1955 at Saint Philip Neri Catholic Church Cemetery, Empire, Leelanau, Michigan. [S346] Traverse City Record Eagle, 1955 December 15. Page 16. [S250] U.S. Federal Census 1930 U.S. Federal Census, by Ancestry.com, ED45-6. Dwelling 40. Name Variation Sophia Teresa Albrecht was also known as Sophie Teresa. Name Variation Sophia Teresa Albrecht was also known as Albright. Married Name circa 1902 As of circa 1902,her married name was Denny. Sophia Teresa Albrecht was born on 12 October 1883 at Ludington, Michigan. She was the daughter of Anthony Albrecht and unknown (?). Sophia Teresa Albrecht married Frank Denny, son of Frank Darno Denny and Martha Elizabeth Rafferty, circa 1902. She was buried after 25 December 1950 at Saint Philip Neri Catholic Church Cemetery, Empire, Leelanau, Michigan. Sophia Teresa Albrecht had 5 with 5 living in 1910 children. [S346] Traverse City Record Eagle, 26 Dec 1950. Name Variation Clifford C. Denny was also known as Cliff. Clifford C. Denny was born on 17 July 1904 at Michigan. Clifford C. Denny married Agnes M. Gallivan, daughter of Daniel Gallivan and Delia Raftery, on 27 November 1929. Clifford C. Denny obtained US Social Security Card at Michigan; last residence Traverse City, Grand Traverse, Michigan. He and Agnes M. Gallivan lived in November 1945 at Traverse City, Grand Traverse, Michigan. Clifford C. Denny lived in December 1955 at Traverse City, Grand Traverse, Michigan. [S346] Traverse City Record Eagle, 1945 December 5. Page 6. Name Variation William Minor Denny was also known as Minor. William Minor Denny was born on 17 February 1906 at Michigan. William Minor Denny married Josephine Dorothy Abeare, daughter of Alexander J. Abeare and Ruby J. Western, on 25 November 1933 at Empire, Leelanau, Michigan. William Minor Denny died on 12 March 1982 at Swartz Creek, Genesee, Michigan, at age 76. William Minor Denny lived in November 1945 at Flint, Genesee, Michigan. He lived in December 1955 at Flint, Genesee, Michigan. He lived in 1994 at 4142 S. Dye Rd, Flint, Genesee, Michigan. He lived in 2000 at 4142 Dye Rd, Swartz Creek, Genesee, Michigan. Married Name 24 October 1927 As of 24 October 1927,her married name was Bishop. Lila M. Denny was born on 7 July 1907 at Michigan. She was the daughter of Frank Denny and Sophia Teresa Albrecht. Lila M. Denny married Eugene F. Bishop, son of Horace Lemuel Bishop and Bertha M. (? ), on 24 October 1927 at Frankfort, Minnesota. Lila M. Denny died on 5 August 2003 at age 96 Lila M. Bishop, 96, of Elberta, died Tuesday morning at The Maples. She was born July 7, 1907, in Empire, the daughter of Frank and Sophia (Albright) Denny. Lila was a member of St. Ann Catholic Church and Altar Society. She was a former member of the Periwinkle Garden Club and responsible for planting the flowers in the flower garden in Elberta. Lila married Eugene Bishop in Frankfort on Oct. 24, 1927. That same year they opened Bishop's Grocery in Elberta, which they owned and operated together for 42 years, retiring in 1970. Lila is survived by two sons, Louis (Mary Kathryn) Bishop and Michael (Betty) Bishop, both of Frankfort; 11 grandchildren, 13 great-grandchildren, one great-great-grandchild; and a sister, June (Paul) Kraus of Pittsburgh, Pa. Preceding Lila in death were her parents; her husband, Eugene, on May 9, 1996; a son, Kenneth in 1987; a granddaughter, Karen Quine; a sister, Shirley Bergsten; and three brothers, Clifford, Minor and Otto Denny. A funeral Mass will be celebrated at 11 a.m., Saturday, Aug. 9, from St. Ann Catholic Church, with Father Ray Cotter as celebrant. Friends may call on Friday, from 4 to 8 p.m., at the Frankfort Chapel, McElduff Funeral Homes, where a rosary will be recited at 8 p.m. Visitation will continue at the church on Saturday one hour prior to the Mass. Memorial contributions may be directed to St. Ann Catholic Church. Lila M. Denny obtained US Social Security Card at Michigan; last residence Elberta, Benzie, Michigan. She and Eugene F. Bishop lived in November 1945 at Elberta, Benzie, Michigan. Lila M. Denny lived in December 1955 at Frankfort, Michigan. [S250] U.S. Federal Census 1930 U.S. Federal Census, by Ancestry.com, ED10-10. Dwelling 97. Married Name Her married name was Tobin. Married Name before December 1950 As of before December 1950,her married name was Bergsten. Shirley L. Denny married Harold John Tobin, son of John King Tobin and Charlotte Hutzler. Shirley L. Denny was born on 8 June 1909 at Empire, Leelanau, Michigan. Shirley L. Denny married Rudolph W. Bergsten, son of Victor Bergsten and Anna Charlotta Carlson, before December 1950 at 2nd marriage for her. Shirley L. Denny died on 24 July 2003 at Traverse City, Michigan, at age 94 Shirley L. Bergsten, 94, of Traverse City, formerly of Empire, died Thursday morning at Tendercare of Traverse City. Born June 8, 1909, in Empire, she was the daughter of Frank and Sophie (Albright) Denny. A lifelong resident of Empire, Shirley was a member and active participant of St. Philip Neri Catholic Church and the Ladies Guild. As a homemaker, she thoroughly enjoyed gardening and cooking for her family and many friends. Survivors include her two sons, John (Dorothy) Tobin of Honor and Donald Tobin of Traverse City; two daughters, Norma J. (David) Marmie and Loretta Tobin, all of Traverse City; two sisters, June (Paul) Kraus of Pittsburgh, Pa. and Lila Bishop of Elberta; 11 grandchildren, 19 great-grandchildren, four great-great-grandchildren and many nieces and nephews. Shirley was preceded in death by her husbands, Rudolph W. Bergsten and Harold Tobin; a daughter, Judy Tobin; three brothers, Clifford, Minor and Otto Denny; and a grandson, Clint Emert. Friends may call at St. Philip Neri Catholic Church this evening, from 5 to 8 p.m., where a rosary will be prayed at 7 p.m. A funeral Mass will be celebrated at the church on Monday, July 28, at 11 a.m., with the Rev. William Lipscomb serving as celebrant. Burial will follow the service in St. Philip Neri Catholic Cemetery. In remembrance, memorials may be directed to Mass intentions or the charity of one's choice. The family is being served by the Reynolds-Jonkhoff Funeral Home in Traverse City. Shirley L. Denny obtained US Social Security Card at Michigan; last residence Empire, Leelanau, Michigan. She and Harold John Tobin lived in November 1945 at Frankfort, Michigan. 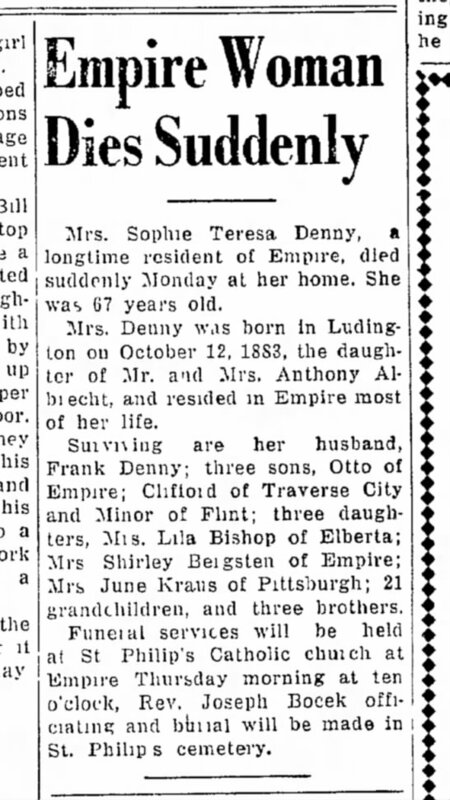 Shirley L. Denny lived in December 1955 at Empire, Leelanau, Michigan.